included as accessories are a clamp for holding the tube when not in use and self adhesive foil for damaged record labels. By employing reduced air pressure, the clamp presses the record firmly onto the turntable mat. Distortion and tonal colourations are thereby effectively prevented, especially with thin or warped records. The advantage of the technique employed is that the platter bearing and spindle are not subjected to reduced air pressure during record play. Therefore, vacuum seals which could impair rumble and wow and flutter performance are not required. 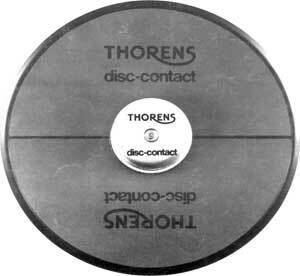 Thorens Disc Contact / Disc Contact owners manual, service manuals and schematics are for reference only and the Vinyl Engine bears no responsibility for errors or other inaccuracies. The PDF files are provided under strict licence. Reproduction without prior permission or for financial gain is strictly prohibited. This website is not affiliated with or sponsored by Thorens.